Coming up we’ll hear from Michael Rivero of WhatReallyHappened.com. Michael gives us his uncensored opinions on the recently concluded political conventions, why he sees this as a crucial election for the future of our Republic, and why he views precious metals as a must-own asset for the tumultuous times ahead. Don’t miss another fantastic interview with Michael Rivero coming up after this week’s update. Well, much to the dismay of Republicans and a great many Democrats, the Democratic National Committee formally put up Hillary Clinton to be the next President of the United States. Hillary’s coronation was met with boos, heckling, and walk outs by scores of rank and file Democrats. They believe, and with good reason, that their own party rigged the system on behalf of a crooked candidate. News Anchor: It is the worst possible scenario for the Democrats on the week of their convention, 20,000 emails hacked and leaked by Wikileaks. Emails that prove the DNC and the Clinton campaign did in fact rig the primary. Economic Commentator: The system is rigged. Donald Trump: You know, the system, folks, is rigged. It's a rigged system. I have seen firsthand how the system is rigged against our citizens just like it was rigged against Bernie Sanders. Bernie Sanders: When we talk about a rigged system, it's also important to understand how the Democratic Convention works. The way the system works is you have establishment candidates who win virtually all of the Super Delegates. Donald Trump: We can't fix a rigged system by electing the people who rigged it in the first place. That, of course, was the voice of GOP nominee Donald Trump. He managed to do what Bernie Sanders couldn’t and defeated his party’s entrenched establishment. Trump successfully tapped into a populist wave of resentment against rigged politics and rigged media coverage. He probably couldn’t have done it without the Internet. It has taken power away from conventional gatekeepers of information and enabled alternative viewpoints to get out to the public directly without going through establishment filters. Old media is dying. Every month, more people cancel their cable TV and newspaper subscriptions and get more of their political and financial information online or even from AM and satellite radio. They go to websites such as Breitbart, the Drudge Report, and Zero Hedge. And they listen to podcasts. We’ve interviewed guest experts who have been ignored or banned by mainstream media outlets for daring to hold controversial views on subjects such as market rigging. We’ve heard from people like Gerald Celente and Chris Powell of the Gold Anti-Trust Action Committee who both believe strongly that markets are rigged. 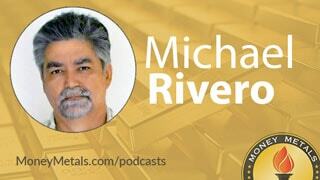 Our guest today, Michael Rivero also doesn’t pull any punches and sees it the same way. We’ve also heard from skeptics like Dan Norcini who DON’T believe markets are rigged – at least not in a systematic way. Of course, the question whether the stock market or the bond market or gold and silver markets are rigged depends on the definition of “rigged.” Does a cabal of central planners meet every day in a secret location to decide which way to move markets? Probably not. Is each and every down move in gold and silver prices attributable to a deliberate attack by the banking cartel? Again, probably not. Does the fact that market moves aren’t always the result of manipulation mean that all markets operate freely and fairly all the time? Definitely not! The flip side of unrealistic conspiracy theories about rigged markets is unrealistic assumptions about fair, free, and perfectly efficient markets. The fairy tale story that banks never cheat, governments never intervene, and central banks never stray from their pubic mandate is demonstrably false. In recent years, some of the world’s largest banks have been hit with billions of dollars in penalties for manipulating interest rate and commodity markets. Earlier this year, Deutsche Bank agreed to settle lawsuits brought against it for rigging gold and silver markets. The German banking institution is now on the brink of collapse after overextending itself in a host of other markets. When governments and central banks manipulate markets, they of course go unpunished. It’s no secret that the federal government has a “plunge protection team” called the President’s Working Group on Financial Markets. It’s also no secret that the Federal Reserve intervened so heavily in the bond market through Quantitative Easing that it became the largest single holder of U.S. Treasury securities. These aren’t conspiracy theories. These are simply facts. So, yes, markets ARE rigged – at least to some extent. There are institutionally backed traders in futures markets who are trying to drive down gold and silver prices right now. Maybe they will succeed in the near term and maybe they won’t. But in the long run, they won’t be able to manipulate the physical supply of metal or contain the demand for it. Physical fundamentals will ultimately trump any paper shenanigans that take place in futures markets. That’s the perspective precious metals investors need to have. As long as the fundamental reasons for owning gold and silver remain, and as long as you intend to hold your positions for the long term, there is no reason to let frustrations with a rigged system dissuade you from a prudent allocation to physical metals. Checking in with this week’s price action in metals markets, gold and silver each got a boost Wednesday following the Federal Reserve’s decision to leave its benchmark interest rate unchanged. The odds of the Fed doing anything before the election now appear to be slim to none. As of this Friday recording, gold trades at $1,348 an ounce, up 1.8% for the week. Silver prices currently come in at $20.33, good for a 3.3% weekly gain. And the platinum group metals continue to gain upside momentum. We talked last week about how platinum could start to play catchup versus gold and narrow the historic discount to gold that platinum has had in recent months. Well it was a banner week for the industrial metal. Platinum is up 6.7% since last Friday’s close and currently trades at $1,158 per ounce. Meanwhile palladium is advancing for the sixth straight week to bring spot prices to a 13-month high at $714, a gain of 3.9% week over week. Mike Gleason: It is my privilege now to welcome in Michael Rivero, founder and editor of WhatReallyHappened.com. Michael is a prolific commentator on geopolitics, financial markets, and many other topics, and also hosts a daily radio show where he comments about it all. Michael, it's always great to have you with us. How are you? Michael Rivero: I'm doing fine. Thank you very much for having me back on the show. Mike Gleason: Well I'm sure you've been enjoying all of the political theater like we have these last couple of weeks and I'll start off by getting your comments on the silly season that is now fully upon us. We had the Republican Convention last week and now the Democrat Convention. It's certainly provided some fabulous entertainment. There's never been candidates or campaigns quite like what we have this year. What are some of the key takeaways between, let's say, what we saw last week in Cleveland versus what we're seeing this week in Philadelphia, Michael? Aside from the obvious, did you notice any major differences between the two conventions or did you take note of any particular themes, et cetera? Michael Rivero: Well obviously one of the major differences is that the Democratic Convention was dealt that hammer blow by WikiLeaks data dump of the internal DNC emails. And that really did throw the entire affair into chaos. I think what the American people are waking up to, looking at both conventions, we saw the party machines fully on display trying to overturn the will of the voters in terms of the selection of the candidates. At the Republican Convention there was a last-ditch effort to find some way to unbind the delegates so they could vote for somebody outside of Donald Trump. That was defeated. And over on the Democratic side the revelations from the DNC emails is that, yes, in point of fact, the Democratic Party machine was pro-Hillary, anti-Bernie Sanders. They're supposed to be unbiased. The scandal was so big it led to the resignation of Debbie Wasserman Schultz, who is the chair of the DNC, whereupon she was immediately hired by Hillary to manage the voter outreach for Hillary's campaign for all 50 states. Which is kind of weird because Hillary Clinton did an interview on 60 Minutes in which she actually stated on camera she had no idea the Democratic Party was engaging in all of these shenanigans against Bernie Sanders, but of course, if it was real shock to her then why did she give Debbie Wasserman Schultz that job. Now there are already major lawsuits that have been filed regarding the fraud in the Democratic primaries. And there's one report that we have linked to WhatReallyHappened.com in which they have looked at the known instances of fraud in the Democratic primaries and calculated that it cost Bernie Sanders 184 delegates. And what that comes down to is without the cheating, Bernie Sanders would have won the nomination. Because those 184 delegates that we know of that were stolen from Bernie Sanders and given to Hillary Clinton is what put Hillary over the top. Even with the super-delegate advantage she was trailing in the popular vote the whole season, then all of a sudden it's Miss Hillary and they're out there trying to basically distract the public from the exposure of this obvious party machinery game playing by claiming it's all a Russian plot. "Ooh, it's those evil Russians. Poor Hillary's the victim of Vladimir Putin and that's why you should support her as president." The spin is getting desperate to the point of madness, some of the stuff they're coming up with now… there was an article in one of the British newspapers where research by psychiatrists are pointing out that the only reason Donald Trump is doing so well is that the American voters just aren't mentally capable of evaluating who's the best candidate to be president. And of course, what they're trying to pretend is Benghazi's not a factor, the private email server's not a factor, Travelgate, Chinagate, Vince Foster, all of that stuff is completely irrelevant; the only reason people are not supporting Hillary Clinton is they have this mental illness where they just don't like her. And it's a rehash of one of Hillary's propaganda stunts from before. They're down to the point of recycling. They're back to saying, "Oh, the only reason they're not supporting Hillary is they can't stand the idea of a woman in the Oval Office." But they've worn these propaganda tricks out and they're not really getting a lot of traction with them. Mike Gleason: So who do you see winning the election this fall, Trump or Hillary? And what's your take on the impact of a third-party candidate like Gary Johnson, of the Libertarian Party, or Green Party nominee, Jill Stein, who are each now polling in the 5 to 10 percent range? What are your thoughts there? Michael Rivero: Well it all depends on from which of the two establishment parties these third parties are going to draw votes from. And I think both of them are going to tend to draw more votes away from the Democrats than from the Republicans. The open question, of course, is knowing for an absolute fact that there was massive election fraud during the Democratic primaries, it stands to reason that Hillary is going to try and steal the November election. In an honest election Bernie Sanders would be the Democratic nominee. In an honest election Donald Trump is going to win. He's already polling double digits ahead of Hillary Clinton but it's not enough to be ahead of her by 11-12 percent, he has got to score an overwhelming landslide that is so huge the vote riggers don't dare try and reverse it because it would be too obvious what happened, and that could trigger rioting and protests all across America. Mike Gleason: Michael, so with presidential politics being front and center until November, does that mean we'll experience a period of peace and quiet on Wall Street leading up to the election as investors await the outcome? Now this certainly doesn't appear to be your typical election but what are you anticipating there in the markets between now and November? Michael Rivero: Well we're looking at an economy that is showing signs of increasing strain. Deutsche Bank is in trouble, the Italian banks are in trouble, and the pattern from history has always been that during an election year, especially the second half of the election year, the government is going to do everything they can to make the economy look like it's working in order to support the incumbent party, the incumbent candidate. And certainly Obama is well motivated to try and make the economy look good in order to build support for Hillary, but at this point they may be fighting not just a holding action, it may be a losing battle because there are so many factors out there that are really starting to strain the whole global economic system. It's almost a question of whether it's going to start unraveling before or after the November election. It could happen before, and at this point it's only going to turn the voters even more firmly away from the establishment and towards Donald Trump. And I think we need to be very clear about something. If the U.S. Government had been doing their job correctly for the American people and the nation, if the economy really was sound and was taking care of the nation as a whole rather than simply plundering it, Donald Trump's campaign would have been a footnote because of his very brusque way of addressing the audience. But Donald Trump is a populist, reactionary candidate. And his popularity is based on the fact that the American people are tired of business as usual. They're tired of politics as usual. They're tired of the wars. They're tired of all of these bailouts, which are basically the government taking a trillion dollars from the American people and giving it to the banks so the banks can loan it back to the American people at interest. They understand that the current establishment is very much in favor of the bankers interests over and above those of the ordinary citizen. Hillary's selection of Tim Kaine as vice president only firmed up that impression because he's on the record as saying, even today, he thinks there are far too many regulations on Wall Street. So this election really isn't about Republican versus Democrat or liberal versus conservative, it's basically the American people against that one percent establishment of money junkies and their cronies in Washington DC. And I think that's one of the reasons why it's going to be very chaotic between now and November. Now that Donald Trump is the nominee, now that he's ahead in the polls, I would hate to see it happen but I'm expecting that there's going to be a serious attempt on Donald Trump's life, probably even before they can schedule a presidential debate between Donald Trump and Hillary Clinton. Because Hillary Clinton is not a good extemporaneous speaker. She is all pre-rehearsed, teleprompter, canned responses to questions that they know the media is going to ask. In fact, that's one of the revelations that came out of the DNC emails is how the Democratic National Committee was coordinating with the media to basically say, "When you talk to Hillary Clinton, these are the questions you will ask." And the corporate media began to pull away from that, which is why Hillary has not risked an open question press conference in 230-odd days now. But if she gets into a debate with Donald Trump, he can think on his feet. He's saying what he really believes and really knows. He's basically going to eat her alive in an open, public debate. And I have absolutely no doubt Hillary is going to try to be in control of the venue of the debate, in control of the moderators to try and shift it her way, but she's really not going to be able to stand up to Donald Trump. And so I think if there's going to be a dramatic attempt to get rid of the GOP nominee, it'll happen before any scheduled presidential debates. Mike Gleason: We haven't had you on since the Brexit decision. So even though it appears much of the world has now digested that major news story, I want to get your thoughts on the longer term impact there. Was this a major blow to the one world government movement, Michael, or will the Brits be the only one voting to restore their national independence? Michael Rivero: This was a major blow to the one world government because we are already hearing, in other countries of the European Union, a desire to leave the EU. A lot of people, especially in Germany, are looking at Brussels as the cause of this immigration refugee problem which has caused all kinds of issues within their country: violence, sexual assault, and certainly these refugees who are coming on in are acting in a very aggressive manner. They're coming in with the attitude of, "You who have lived here all your lives, you have to change your lives completely to follow our religion and our standards of living." That, of course, is not something that's going to be very well received. President Theodore Roosevelt I think stated it quite clearly and perfectly: "If you want to come to the United States of America through the legal immigration process you are welcome, but understand that you will have to adapt to our culture, to our language, and to our way of life." That's just good manners. Back in the 1980s when I was doing some film work in Italy and Germany I made a serious effort to learn as much Italian and German as I could. And I probably generated quite a bit of laughter among my coworkers, but at the same time there was that respect that I had made the effort to learn the indigenous language rather than come on in like the classic ugly American and say, "Why aren't you all speaking English?" Which by the way most of them did excellently anyway. Mike Gleason: You alluded to it a moment ago but the refugee and Muslim terrorism crisis in Europe seems to get worse by the week. The other day a group of Islamists executed a Catholic priest in France by cutting his throat in front of his congregation after conducting some sort of bizarre ritual around the altar of the church. You have to believe that the average European citizen has probably had just about enough of this and isn't going to stand by much longer without demanding some major actions being taken by the EU politicians to address this crisis in a meaningful way. So how do you see this resolving itself? Michael Rivero: Well the EU politicians are basically taking the attitude that this is just the price you pay to live in a multicultural, blended world. And what I think is going on, as part of that project to create a single global government and a single global private central bank, they're trying to blur all of the ethnic groups together into one mass. They're trying to create a situation in which individual people are losing their sense of a cultural identity, a regional identity, a historical identity. This idea that Sweden is no longer Sweden if only 20 percent of the people living there are Swedish, and to just sort of erase that old model of national borders. Unfortunately it has backlashed horribly and it wasn't really thought out all that well. And it is creating a huge problem, but we're seeing that most of the European Union countries are standing firm. Their leaders are all part of this new world order agenda. Hungary is an exception; they're going to close their borders. But over in Germany, Angela Merkel is out there admitting the refugee crisis has caused a wave of violence and terrorism all over Germany but still insists we need to bring in another million refugees. So she will not survive her next election. Mike Gleason: Switching gears here a bit. Gold and silver prices surged along with bond prices following Wednesday's Fed announcement. This despite Janet Yellen, once again, assuring everyone that even though the FOMC isn't moving to withdraw stimulus yet, the economy is getting stronger and officials may hike rates soon, maybe even is September. Normally this sort of jawboning will at least drive some sort of short-term move lower in the metals and a sell-off in treasuries, but that's not what we got. What do you think is happening here? Have Fed officials finally lost the remainder of their credibility? Michael Rivero: Yeah, I think that's it and I think most smart investors understand it. During an election year the government and the bankers are going to try and make the economy look good in order to keep the incumbents elected. I don't think it's going to work, first of all, because the Federal Reserve has missed so many predictions and is now seen as the root cause of the problems rather than any kind of a solution. And coupled with that there are clear indications that the November election, along with Donald Trump potentially winning – if it's not stolen from him – there is a major anti-incumbency fever sweeping the American people right now. We're seeing a lot of the old-guard, establishment politicians are now facing major uphill fights for reelection and likely to lose: Debbie Wasserman Schultz in Florida, John McCain in Arizona, Paul Ryan, all of a sudden the poll numbers are just shifting against them. Mike Gleason: One story that's come out just recently is how the U.S. has suddenly been importing a huge amount of gold from Switzerland, which is where a lot of the world's refining is done. Are the tables turning here? And are investors in the West starting to wise up and try to get back some of that gold that's been flowing to Asia in massive levels over the last few years? Any theories there as to why we've gone from being a net exporter of gold to a net importer, at least in the recent months? Michael Rivero: Well there's a couple of overlapping factors. Demand for gold as a preserver of wealth is up all around the globe. China is one of the world's largest producers of gold, but there's so much domestic demand for gold in China they're actually starting to import gold from Russia. So, yeah, bullion dealers, coin dealers, are trying to get hold of physical metal to meet their demand. The other factor could very well be that the Federal Reserve in New York and JP Morgan and these other bullion storage vaults, they got caught playing fast and loose with other people's gold. The German demand for repatriation kind of triggered it. And we actually covered this a lot in an episode of History Channel's 'America's Book of Secrets: The Gold Conspiracy,' in which the New York Federal Reserve was taking other people's gold to store for a fee, like a safety deposit box, then they were turning around and taking that gold and leasing it out the backdoor. And then they got caught because they couldn't get it back. And that's what led to that big stink about Germany only getting a tiny fraction of their gold back. It wasn't the original numbered and hallmarked bars, and assays showed it wasn't even anywhere near as pure. And so rather than risk a gold run, I'm certain that the New York Fed and JP Morgan and the U.S. Government as a whole are trying to get their hands on as much gold as they can to reassure the rest of the world that the gold they placed for safekeeping in these various vaults is in fact still there. That's another overlapping factor. Mike Gleason: After the big rally in conventional stocks since the first couple of days of Brexit, the metals have continued to show strength and resilience despite the “risk on” trade reasserting itself and even after the huge gains the metals had in the first half of 2016. Do you have any predictions on what we'll see in the gold and silver markets later this year, and into next, with the election and other various geopolitical events? Michael Rivero: Well ignore the day-to-day ups and downs because there's a lot of rigging going on and the public is now aware of that, which is why they're losing confidence in those paper products. But always in the long-term metals are going to improve in value. One of the problems that the paper money is dealing with, it's estimated now that global quantitative easing is now running $180 billion per month. And that kind of inflationary pressure is going to have to push the value of the paper currencies down, and as a result gold and silver and other metals like platinum inevitably are going to rise. So in the long term having gold and silver is always a good idea. And even if you're not making a huge profit with gold and silver, at least it is a reliable store of wealth under your own control. All of the paper products are always dependent on your money being in somebody else's computer where they can grab it and play with it, and it could literally vanish overnight. So a lot of people, they've lost trust and faith both in the corporate financial world, because of all these scandals of rigging, HSBC tangled up with drug running. They want something that is trustworthy and most people instinctively trust something that they can hold in their hand. Mike Gleason: Well as we begin to close here, Michael, any final comments, anything you're keeping an eye on here in these coming weeks and months? Michael Rivero: Well obviously what is uppermost in my mind right now is the fact that it is now documented that the Democratic National Party and the Hillary campaign cheated to win her the nomination, which means in all probability they're planning on cheating to win in November. So for those who are concerned about Hillary as president of the United States of America, don't let Donald Trump's 11-12 point lead in the polls convince you that you can sit at home. You need to get on out there and support him and vote for him. We need to literally give him an 80% win in November or those election riggers are going to steal it away from him. We are on the verge of losing our republic to an absolute iron-fisted dictatorship in which the elections are a complete fraud and our country is ruled by corporate special interests. This is a very, very dangerous time. I don't think the United States has been at risk of losing its soul, as a republic, so much in its entire history. Mike Gleason: Yeah, figures will be very interesting over the next several months. Well, Michael, thanks for your enlightening and candid comments. It's always great to have you on and get your no-nonsense take on these global matters. Now before we let you go, as we always do, please tell folks about how they can hear you on your daily radio show and then also mention the website. Michael Rivero: Well the website is WhatReallyHappened.com. We've been running this website in various forms and different names for over 20 years now. I was a blogger before they'd even invented that word. My radio show runs from 3pm to 6pm Central U.S. time on the Republic Broadcasting Network. And if you go to WhatReallyHappened.com during the show time, there's a little "listen" logo button you can click to go Republic Broadcasting. We also have a Bambuser video adjunct as well. Mike Gleason: Well it's great stuff as usual. Thanks again, Michael. We appreciate your time as always, and look forward to our next conversation. And I hope you had a great weekend. Michael Rivero: All right. Well thank you very much, and the same to you. Check back next Friday for our next Weekly Market Wrap Podcast. Until then, this has been Mike Gleason with Money Metals Exchange. Thanks for listening and have a great weekend, everybody.